Reached by causeway from St. Simons Island, Sea Island is an internationally acclaimed resort. 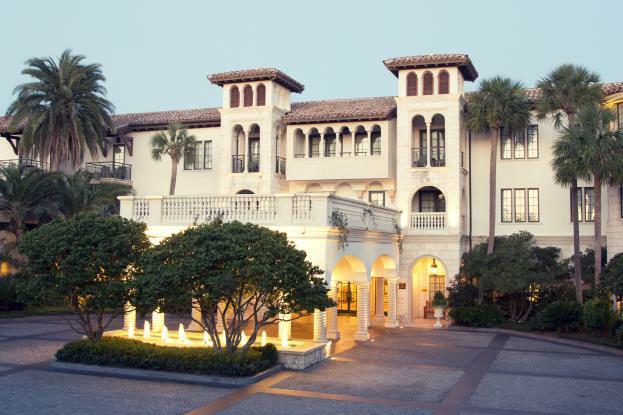 The Sea Island Company features two of the world’s most exceptional destinations: the Forbes Five-Star Cloister on Sea Island and The Lodge at Sea Island, a Forbes Five-Star and AAA Five-Diamond property located on the southern end of St. Simons Island. In fact, Sea Island is the only resort in the world to achieve four Forbes Five-Stars eleven years in a row. Guests of Sea Island who enjoy the game of golf can appreciate the Golf Performance Center and three championship golf courses at Sea Island Golf Club. The Seaside Course, home to the PGA TOUR’s RSM Classic, is a links style course graced by majestic ocean vistas in the tradition of St. Andrews. The Plantation Course, also home to RSM Classic, winds enticingly through marsh and forest, while the Retreat Course offers a uniquely dramatic and challenging design cultivated by Davis Love III and Mark Love. Stay at The Lodge for the most convenient access to the golf club and courses. In addition to golf, Sea Island has endless activities for guests and residents to experience. Enjoy the Sea Island Beach Club, Tennis Center, Yacht Club, Shooting School or Forbes Five-Star Cloister Spa at Sea Island. Alternate your days between relaxation and rejuvenation, and adventure and exploration. Visitors can tour the island&apos;s pristine marshes by kayak or sailboat, or participate in an educational nature walk. For a luxury experience, try horseback riding. Sea Island has horseback riding options for all ages (3+), whether you want to ride along sandy beaches or through the marshes. Interested in trying something new? Guests can partake in lessons and clinics for activities such as sailing, fishing and tennis! For more information on things to see and do on Sea Island, view our Guide to Sea Island. Sea Island offers cuisine to satisfy any taste with exceptional dining venues, including the renowned Forbes Five-Star Georgian Room, which is open to the public. With a diverse selection of eateries, guests can savor unique dishes and varying ambiances for casual and fine dining. Enjoy Italian cuisine at Tavola, local seafood at Southern Tide, milkshakes at Wonderland or poolside snacks at the Snack Shack. For more information about dining in and around Sea Island, view restaurant listings in the Golden Isles. Sea Island provides private transportation options to and from the airport with advanced reservations. Once on Sea Island, you don&apos;t even need a car with additional on-site transportation available. Guests of The Inn can enjoy complimentary vehicles on a first come, first served basis. And with miles of bike-friendly paths, visitors can reserve bicycles to easily access different parts of the island. Looking for the latest deals for Sea Island? View our current specials and packages to see if there&apos;s one to fit your travel needs and tastes. In order to gain regular access to Sea Island amenities, for those who are not guests of the resort, Sea Island Club memberships are required. For more information on member amenities and current opportunities to become a member, visit the Sea Island website.